High in fiber, potassium and vitamins A, C and K, blueberries pack a hefty nutritional punch. Unfortunately, in some cases, they can have side effects, including gastrointestinal distress, hypoglycemia and an increased risk of bleeding if you're taking certain prescription medications. If you're healthy, eating blueberries as part of a balanced diet isn't likely to cause side effects. However, if you have a medical issue, check with your doctor before adding them to your diet. Blueberries contain high amounts of salicylates — the active ingredient in aspirin that's also found naturally in many plants — which can cause side effects in people who are sensitive to them. For those who can't tolerate salicylates, blueberries might cause a rash, headaches or a host of gastrointestinal symptoms, including nausea, vomiting, reflux, bloating, gas, diarrhea and constipation. Blueberry juice is especially high in salicylates. But eating blueberries in small amounts may ease some of the pain and discomfort associated with the ingestion of salicylates. Blueberries contain 29 micrograms of vitamin K per 1-cup serving, making them a "medium" vitamin K food. Vitamin K performs a number of important functions in the body, including regulating blood clotting and maintaining bone density. People who take prescription blood thinners are generally encouraged to keep bloodstream levels of vitamin K the same from day to day. Suddenly increasing or decreasing your intake of foods rich in vitamin K without asking your doctor to make changes to prescription blood-thinner dosages can lead to an increased risk of bleeding. If you've been diagnosed with diabetes, taking blueberry leaves as a supplement can cause a dangerous drop in blood sugar levels. Always check with your doctor before adding any supplements, including blueberry leaves, and monitor your blood sugar carefully. Eating blueberry fruit is likely safe for people with diabetes; a 1-cup serving contains 21 grams of carbohydrates. Blueberries are one of the common food culprits that have the potential to stain your teeth because of their intense pigmentation. Whether you eat them fresh, frozen, juiced or preserved in jelly or jam, the deep-blue hue can discolor your tooth enamel or white fillings. It may be possible to combat the staining effect by drinking water after eating blueberries. Follow up with milk to neutralize the acid and keep your teeth strong. A serving of hard cheese after eating blueberries may also be of benefit to maintaining that pearly white smile. 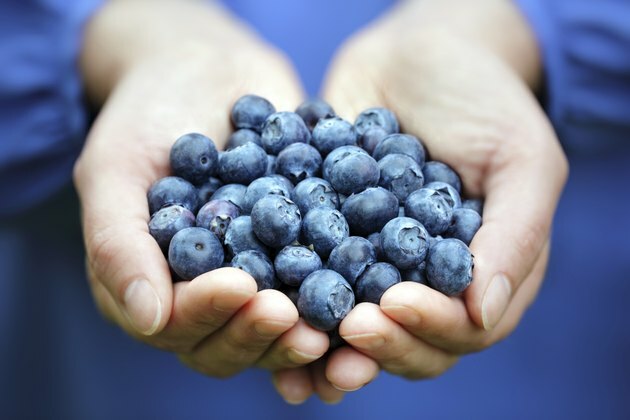 When eaten in moderation, blueberries can play an important role in a healthy, balanced diet. According to ChooseMyPlate.gov, adults should aim for 1 1/2 to 2 cups of fruit each day, and blueberries can help you meet that recommendation. Consider adding blueberries to hot or cold breakfast cereals or blending them into a smoothie for a quick snack on the go. You can also toss blueberries into salads or pancake batter, bake them in desserts or add them to soups and side dishes. Find out more about the nutrition breakdown of blueberries on MyPlate.